Use this item as a fun and creative way to promote your brand and increase customer loyalty. Print your logo on the stereo speaker and use it as a fantastic promotional giveaway gift to potential consumers. 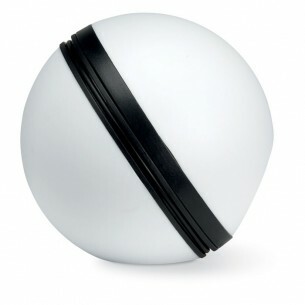 The unique ball shape with a stunning matte finish gives the product a very modern and original appearance. Includes a plug cable for tablets and smartphones. Our primary branding area is the top of this item. This speaker is made from plastic, with colours including black, blue, red . We print this speaker item in up to 2 colours via pad print, which is a technique suitable for almost all artwork and shapes.